Ruck figure by Ardabus Rubber, produced by Kidrobot // Rotocasted: Toy collecting library. Man, this is disappointing. 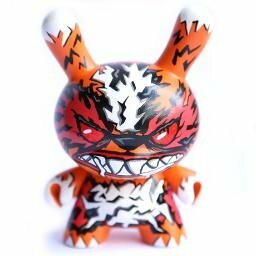 Ardabus has so many great Dunny designs, and I've been saying he deserves a production piece for years. And then this? Google "Ardabus Rubber Dunny" to see what he can really do. I know exactly what you mean shank. Saw this about 6 months ago and couldn't believe he went with this one. He had 2 8" customs at dragatomi and I was tempted to buy both.. really hoped that he was gonna do something like what I saw.. oh well. He mentioned in the KR forum that the name of this dunny is Ruck. Hope someone can update the details. Thanks!